This recent water-wise garden, is looking incredible right now, just one week after the final install of top dressing, d.g., ledger stone and flagstone. 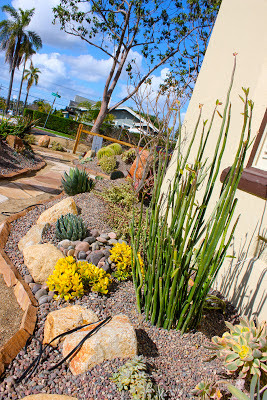 While this garden is dynamic and original - remember it's not a mature succulent garden. 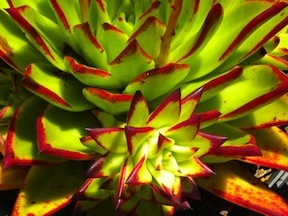 A succulent garden can take a good 3 years to really find its own. Everything will be bigger and bolder. It's always amazing to see how much beauty, color and texture can be infused into a garden in only a few weeks time. However, by next year this garden will be incredible! The trees will have matured - the Palos Verde 'Desert Museums' will be in bloom - and the Euphorbia continifolia (Caribbean Copper Tree) on the corners and front side of the house will be established and be displaying its bright copper/purple leaves, the various aloes will be in bloom, the cacti will bloom, as will the echeverias and other succulents. You have to love the way the ledge stone, river rock, d.g. and flagstone frame the planting areas and pathways. When done correctly, a 'sense of history, of time' is installed with these materials and sets the stage for the plant material. Yes, to the Pedilanthus (Slipper Plant) in this particular spot in the garden! !